The nation's capital, long infamous for its strict gun control, is now one step closer to being forced to comply with the Second Amendment. 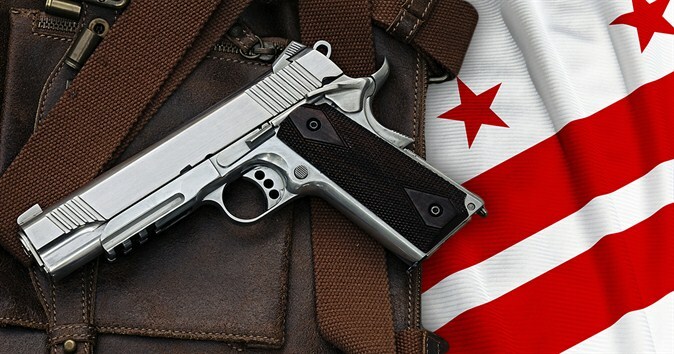 On Saturday, July 26, the United States District Court for the District of Columbia issued a decision in Palmer v. District of Columbia, which challenged D.C.'s ban on carrying firearms in public for self-defense. The court's decision prohibits D.C. officials from enforcing certain provisions of local law that interfere with the constitutional right to bear arms outside the home. D.C.’s former ban on handguns, of course, resulted in the U.S. Supreme Court's decision in District of Columbia v. Heller, which in 2008 recognized an individual right under the Second Amendment to possess firearms for self-defense. Two years later, the Supreme Court made clear in McDonald v. Chicago that the right recognized in Heller protects individuals from infringement by all levels of government, including federal, state, and local. Heller and McDonald, however, only challenged the regulations at issue to the extent they applied to keeping firearms in the home. The Supreme Court did not offer explicit guidance on the degree to which the right to "bear" arms applied to carrying firearms in public places for defensive purposes, because that issue was not squarely before it in those cases. Nevertheless, its characterization of the Second Amendment made judicial recognition of the right to bear arms outside the home all but inevitable. In recent years, federal appellate courts have yielded to the obvious and recognized that the right to bear arms indeed extends beyond one's front door. Notable decisions have included the NRA-backed cases of Shepard v. Madigan, which arose out of an Illinois ban on carrying in public, and Peruta v. San Diego County, which concerned a local regulation that made California's discretionary licensing system for carry an effective prohibition. These precedents featured prominently in the Palmer court's relatively short, straightforward opinion in that case. According to the court's opinion in Palmer, "In light of Heller, McDonald and their progeny, there is no longer any basis on which this Court can conclude that the District of Columbia's total ban on the public carrying of ready-to-use handguns outside the home is constitutional under any level of scrutiny." Predictably, D.C. officials and other gun control advocates have reacted negatively to the decision and have engaged in the same sort of overheated rhetoric about the supposedly "special" dangers of firearms being present in the District as they did during the Heller case. Of course, none of their dire predictions have come to pass as a result of the Heller decision. As with Heller, nothing in the court's decision on Saturday prevents the enforcement of laws pertaining to the criminal misuse of firearms. In both cases, the challenged restrictions made no attempt to distinguish between people who wanted firearms for legitimate versus criminal purposes. Thus, the decisions benefit only those peaceable individuals who conform their behavior to the law, not violent criminals who ignore the law and exploit the law-abiding tendencies of others to further their own criminal activities. At this time, much remains unclear about the practical effects of the decision, particularly as regards those who are not D.C. residents with D.C. registered firearms. Besides the provisions that were specifically at issue in the case, D.C. has additional regulations governing the possession of firearms, ammunition, and magazines that apparently remain unaffected and that could easily snare unwary visitors to the District. For a brief period of time, the MPD, acting on the advice of the D.C. Attorney General’s Office, had suspended enforcement of the laws enjoined by the court’s opinion. Pictures emerged of individuals who took advantage of this opportunity to exercise their right publicly to carry firearms in D.C.
By Monday, however, District officials had petitioned the court to withhold the effect of its decision pending appeal, or in the alternative, for 180 days to allow the D.C. Council to enact new regulations to comply with the opinion. The plaintiffs agreed to a more limited delay of 90 days, and on Tuesday the court issued an order staying the effect of its decision for 90 days to allow D.C. to revisit its laws and to allow the plaintiffs to file arguments against a longer stay pending appeal. The court’s Tuesday order effectively reinstates the status quo that existed before its Saturday ruling, meaning that D.C.’s laws against carrying firearms in public can continue to be enforced. Whether the District will seek further review of the court's decision remains to be seen. District officials have 30 days in which to appeal the case. We will provide further updates as more information becomes available.